. . .Chuck might make a nest on the ground the way Mrs. Peter and Mrs. Jumper do," replied Jumper meekly. "No, siree!" replied Johnny. "Our babies are born in that little underground bedroom, and they stay down in the ground until they are big enough to hunt for food for themselves." "How many do you usually have?" inquired Chatterer the Red Squirrel. "Six or eight," replied Johnny Chuck. "Mrs. Chuck and I believe in large families." "No," replied Johnny Chuck. "Give me green food every time. There is nothing so good as tender sweet clover and young grass, unless it be some of those fine vegetables Farmer Brown grows in his garden"
Peter Rabbit nodded his head very emphatically as if he quite agreed. Contains a fair amount of negative reference to hunters, which I chose to omit while reading aloud to my children. 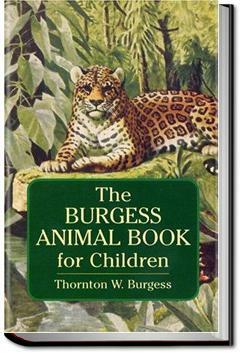 Still the book is full of wonderful information about all the mammals that live in North America. First read by my mother before I was able to read. Great for young children, we listened to it over breakfast and lunch as an audio-book! 4.5 stars. Seems like Burgess books have to grow on me. At first I am always a little put off by the whole "lessons-through-talking-animals" thing. But by the end I really enjoyed this one and my kids (ages 10 and 8) loved it. I thoroughly enjoyed the experience of reading this to my boys for almost a year now. It's packed with great sources of information on each mammal of North America. I'll always treasure the memory of this book. Although I've posted this review on the readily accessible Dover reprint of this children’s literature classic, that’s not actually the version The Eight-Year-Old is reading.